This individual Report The Move to IP at the POS: The Juggarnaut Gains Momentum is available for purchase. 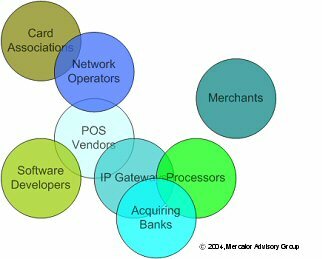 This Report is available to members of Mercator Advisory Group’s Emerging Technologies Advisory Service. Please be advised that this Report is normally part of a research and advisory service that provides ongoing support throughout the year. As such, this Report contains significant depth of content that is selected for its strategic importance to our members. (For a description of these services, see our Advisory Services section). We've become accustomed to the Internet over the last decade, but the Internet as we know it is limited in its reach -- it resides on desktops and a few high-end cellphones. With IP POS, that is set to change; the POS terminal is unshackled and had been given the bandwith to become a device that truly enhances the customer experience. "Internet Protocol will provide the transport mechanism for a new dawn of highly advanced, customer centric POS applications. There will be a wide variety of opportunities, and if the Internet can be seen as a blueprint for how IP at the POS develops, things are likely to happen quickly." "While there is much to be said for being an early participant in the development of products and that this may well prove to be a foot in the door to IP POS market share as the market matures, there will undoubtedly be losers as well as winners. Competition will be fierce and may well be coming from once trusted allies..."
The report contains 10 exhibits and is 28 pages.